Members of the sizeable Chinese artistic community in Australia are positioning themselves as cultural ambassadors capable of making a contribution to the enrichment of Australian culture and to the promotion of Australia’s inter-cultural understanding with China. 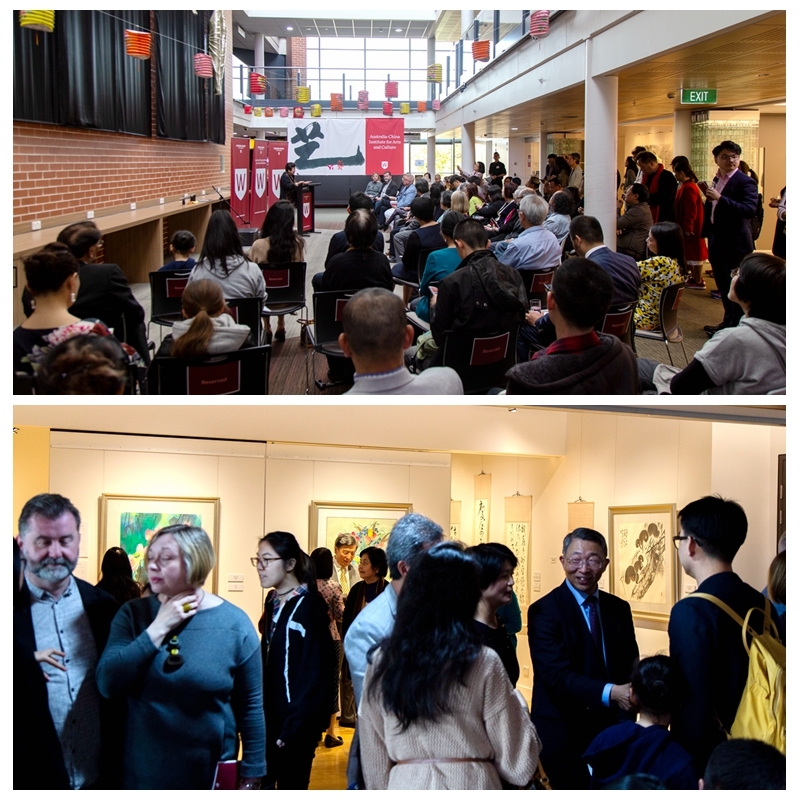 On 22 September, 2018, the Australia-China Institute for Arts and Culture(ACIAC) opened a special community exhibition of artworks by five distinguished Chinese Australian artists in Sydney. Named “Three Perfections” by one of ACIAC’s Advisory Board members, Dr Edmund Capon, former Director of the Art Gallery of NSW and a celebrated expert on classical Chinese art, the exhibition was put together by another of our Advisory Board members, Dr Helen Sham-Ho, former NSW parliamentarian and incumbent President of the Asia Pacific Professional Managers Association, to mark the traditional time of Mid-Autumn in Chinese culture and celebrate the artistic achievements of the Chinese Australian community in the country. The Minister for the Arts of New South Wales the Honourable Mr Don Harwin MLC came to the Institute and opened the exhibition. Dr Helen Sham-Ho moderated the opening. She spoke about the Chinese artistic community in Sydney and introduced her plan and purpose for this Mid-Autumn exhibition. In his speech, ACIAC Director Professor Labao Wang introduced the Institute, welcomed the guests and spoke about the artists. Then Erhu artist Ms Ying Liu contributed to the opening by playing a music piece composed by ACIAC key researcher Dr Bruce Crossman. When the Honourable Mr Don Harwin spoke, he introduced the history and current development of Parramatta as a precinct in Western Sydney and Chinese as an ethnic group in New South Wales; then he spoke about the multiple perfections that this particular Mid-Autumn exhibition embodied and thanked the five artists for contributing to the exhibition and to transcultural communication in the country. The opening of “Three Perfections” drew over a hundred visitors from all around Sydney. Deputy Vice-Chancellor and Vice President of Western Sydney University Professor Denise Kirkpatrick attended the opening. 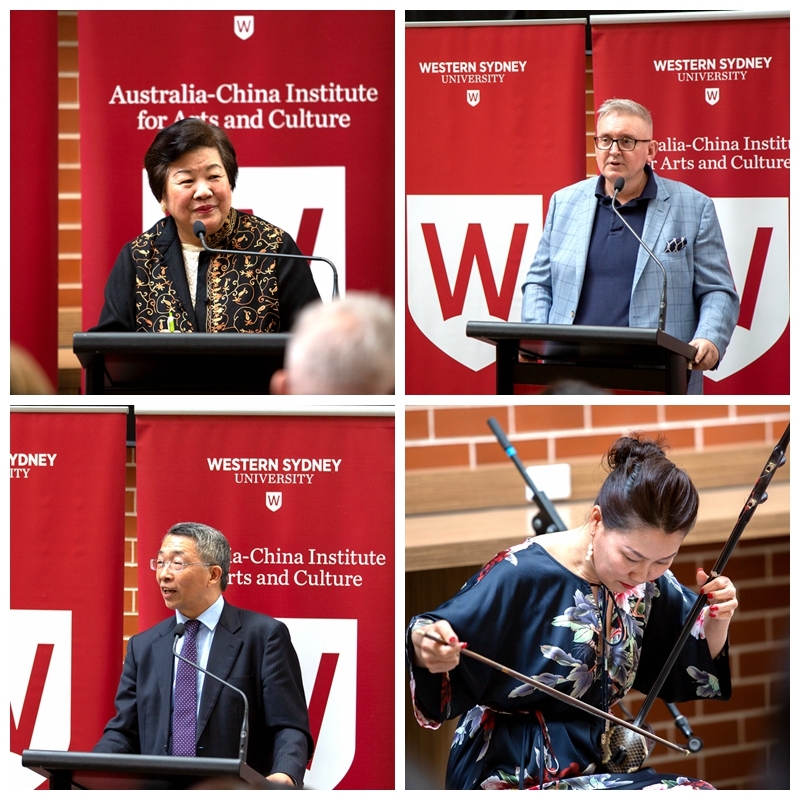 Also in attendance were inaugural Judith Neilson Chair of Contemporary Art, Professor Paul Gladston, of University of New South Wales, Curator of Chinese art at the Art Gallery of New South Wales, Ms Yin Cao, and numerous other luminaries from the local Chinese community.